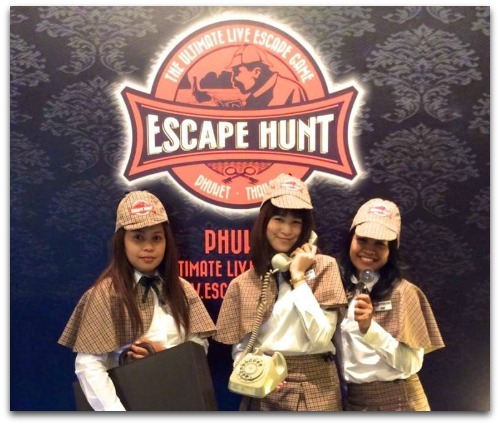 The Escape Hunt closed its doors in Phuket on the 30th April 2017. However if you’re visiting Phuket you won’t miss out as there is another excellent escape game in Phuket called “30 Minutes to Escape”. Read below for further details. 30 Minutes to Escape is the perfect venue if you’re after some interactive activities or a fun way to kill sometime on a rainy day in Phuket. You can read more about the one and only escape game in Phuket here. The aim of the game is to solve challenging mysteries inside purposely designed themed rooms within a set amount of time. Players are locked inside a room, designed according to the theme of the chosen game. There are 6 separate themed rooms, which are divided into 3 different adventures for groups of two to five people. Once inside you will need to use all your detective skills as you uncover clues and decipher puzzles in order to escape from the room before your time runs out! If you are traveling with a larger group you will need to book two separate rooms. Each game will take approximately sixty minutes. Once you have completed the game you can sit and relax while enjoying a complimentary drink before dressing up like Sherlock Holmes for a photograph. Open daily from 9.30am until 8.30pm with the last booking at 7.00pm. This is a stimulating and challenging activity that is ideal for all families and friends, couples and team building sessions.